Socks: I notice people’s socks, being a bit of a sock connoisseur myself. Back when I was in practice there was a Psychiatrist in our practice group who shared my passion for interesting socks. She had a pair of bright yellow socks that had little socks on them. They were always my favorite! Anyhow, I have noticed that the men here in DC are really stuck because of the need to always dress in suits. I mean if you’re not a bow tie or bolero type guy you have very few options for expressing individuality. One way they do it is with socks. And there are some great ones out there. I notice them walking downt the street, in hearing rooms and on the Metro. I am not the only person in my family obsessed with socks. Check out my daughter-in-law’s podcast. The Frying Pan: As the summer heat ramps up walking across in front of the Capitol has started to more and more resemble a trip across a frying pan. No shade and at noon the heat gets close to unbearable. However, there are always entertaining things occurring to keep your mind off the blaze. There’s the guy with the bullhorn. He pops up at various places around the plaza. I first heard him extorting the visitors in line for the Capitol Visitors Center. But have since seen him up on the lawn both on the House and Senate side. His ramblings are not always coherent. But sometimes they cut right to the chase and call out the hypocrisy and corruption of our government institutions. This week he has been supporting the disability rights groups who have camped out in front of the Russell Senate building in an attempt to save their access to healthcare and thereby their very lives. It is refreshing to hear someone one speaking real truth to power. Dogs: Speaking of the frying pan I was walking across one day recently and noticed a very happy police dog running up to folks and sniffing their bags and backpacks. At the same time I saw a woman pulling a rolling suitcase across the plaza. When the dog alerted to this suitcase the woman stopped and took a tennis ball out of her pocket and tossed it for the dog. The pooch and his handler ran off to the grass for some play time. I was about to move off when I noticed another equally happy dog coming across the mall. And the scene was repeated. I stood on the lawn for several minutes watching this training exercise. My, oh my, they were happy dogs once they got their tennis ball. A few weeks later our intern, Allison, and I were walking back from a particularly horrendous hearing on “guest workers” for farms. We had noted a lot of dogs on The Hill that day but couldn’t figure out what was going on until we met Albie and his trainer. They were on The Hill, along with several other service organizations, lobbying service dogs for veterans with PTSD. So Allison and I got a little Albie time at a time that we both really needed a therapy dog. He rolled over and let us scratch his belly. It was soothing and nice for us all. #rollingjesus: So, not every day, most days, as you walk across the plaza sitting in the scant shade by the door to the House side of the capitol is an elderly couple and standing next to them is their rolling Jesus statute. 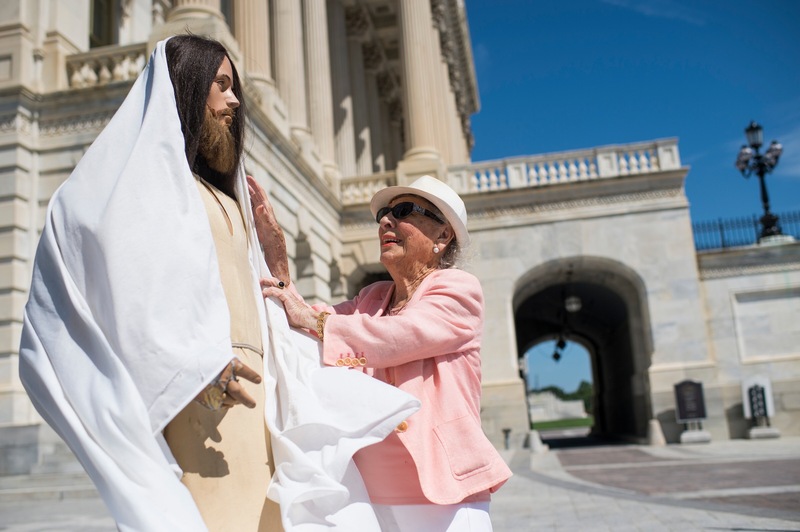 Evidently this woman,Rita Warren, has been carrying this life-size statue of her lord and savior to the steps of the capitol for years. Trying to save the souls of the soul-less. Since her heart attack last year she has help and a dolly to carrying him on. Allison has a brief clip of them rolling the statue up the hill with the caption “another day on the hill.” I will try to embed it for you at a later date as soon as I figure out how. Explosions/Thunder: The thunder bumpers have been fierce at times this month. I was standing out waiting for the circulator bus one afternoon and there was such a loud crack of thunder right over us that everyone jumped and speculated about explosions. On the way back from market two employees of the Library of Congress got on the bus and started talking about the truck that the police had “disrupted” that afternoon in front of the library and what they had done while they were sheltering in place. I checked with them and the bang that I experienced was not at the same time as the supposed “bang” of the truck explosion. I went home and watched the news thinking that surely it would make the evening broadcast if the capitol police had blown up a truck. Nothing. Then next morning in the Post Express was a small paragraph about a truck that had deliberately run over an officer injuring him. Here’s a news clip about it. Evidently they did “disrupt” the car’s trunk. And that is how the rumor mill works in the swamp. My House: I found it. 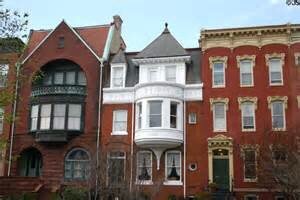 The house I will buy when I get elected to Congress. Here’s a picture (the one on the far left, where else?). Right on the hill. I’m sure it’s very affordable. The Farm Bill: And finally the Farm Bill, or as Michael Pollan suggest calling it the Food Bill, staggers along thru the multiple committee hearings that are required. We did see the final mark-ups on the House and Senate versions of the 2018 agriculture appropriations bills this week. Some funding has been saved. Senator Tester of Montana has made an attempt to save the Under Secretary for Rural Development position in the USDA. We are watching all the machinations and offering input where we can. We really, really need more people to realize how much this bill effects them every day, more than healthcare, more than defense spending. As I often say “We all eat, the lucky of us eat three times a day. And the people who produce that food are called farmers.” They need our support! Which makes me so happy that every podcast Marta does ends with a talk about food and farms. On a knitting podcast. How’s that for cross pollination?